Southeast view of Comb Ridge’s western flank from Comb Wash along County Road 235 south of Utah State Route 95. The extremely rugged light-brown Navajo Sandstone blankets the top of the east-dipping monocline, forming repetitive, sharp peaks and gulches. The underlying dark red-brown Kayenta Formation and pale-red Wingate Sandstone form the rest of the steep sandstone cliff. The cliff’s vertical severity relaxes at the contact with the slope-forming Chinle Formation, which is mostly covered by a collection of large boulders which have fallen from above. The Moenkopi and Organ Rock Formations make up the rocks along Comb Wash.
One may say Comb Ridge was Mother Nature’s way of splitting southern San Juan County with an enormous wall. Another may say it was a giant skateboard ramp for dinosaurs. One thing is certain: Comb Ridge is a spectacular ridge of steeply tilted sandstone rock layers, trending north-south for approximately 80 miles from Utah’s Abajo Mountains to Kayenta, Arizona. Similar to a rooster’s comb, the jagged appearance of Comb Ridge provides the logic behind its name. Comb Ridge is a classic example of a step-like crease (or fold) in the Earth’s crust known as a monocline. Along the axis of the monocline, the rock layers are tilted skyward, whereas they remain relatively flat away from the monocline. The exposed rocks at Comb Ridge range in age from the Permian-aged Organ Rock Formation (280 million years old) to the Jurassic-aged Navajo Sandstone (185 million years old). 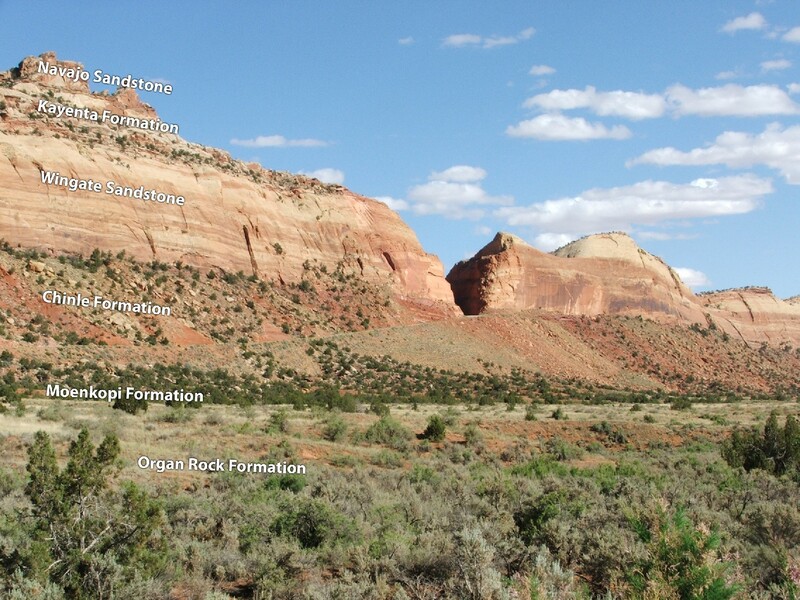 Compressional forces during the Laramide mountain-building event (40–70 million years ago) uplifted an area of southeast Utah known as the Monument Upwarp. Comb Ridge is the abrupt eastern flank of the Monument Upwarp. The San Rafael Swell, Uinta Mountains, and Rocky Mountains are examples of other geologic features that were formed during Laramide time. A. Block diagram of the Comb Ridge monocline. Deep, underlying rock layers ruptured along a compressional fault (blind thrust), pushing the rocks in the west much higher than those in the east. Overlying rocks, not ruptured by the deep fault, deformed by folding over the ruptured layers, creating a monocline. B. The steep cliffs common on one side of many monoclines are mainly the result of stream erosion. Stream flow in Comb Wash played a significant role in eroding away hundreds of feet of rock, carving the beautiful sandstone cliffs on Comb Ridge’s west side. Aerial images from Google Earth. If traveling from the north, drive south from Moab on U.S. Highway 191 for approximately 80 miles to the junction with Utah State Route 95. To view Comb Ridge from the northern road cut, turn west (right) on SR-95 and follow it for 14 miles. Or, continue south from Blanding on U.S. 191 through Bluff (here the highway turns into U.S. Highway 163) 30 miles to the southern road-cut view. If traveling from the west, drive south and east from Hanksville on Utah State Route 95 for approximately 108 miles to County Road 235. From this view point, you can continue east on SR-95 to U.S. Highway 191, and travel as described above to the southern view point. The best time and place to view Comb Ridge is in the afternoon on the west side, from breathtaking road cuts (either Utah State Route 95 southwest of Blanding, or U.S. Highway 163 west of Bluff). If you have an extra hour and 4-wheel drive, travel along Comb Wash on County Road 235 between SR-95 and U.S. 163 to take in 18 miles of beautiful scenery. Glad You Asked: Are those animal tracks in the sidewalk?